This page is designed to organize content that is relevant to the topic of abnormal uterine bleeding (AUB). This term is used often in medicine, and it is important that we become as familiar as possible with it. Abnormal bleeding of any kind (including AUB) can cause medical issues. Most clearly, symptomatic iron deficiency anemia can be a consequence of AUB. Whats more, AUB can be the sign of a more serious underlying disease process. Is the patient pregnant? In all women who have not undergone menopause, a pregnancy test will be required for the evaluation of AUB. Young girls (before menarche): these patients will likely have AUB as a result of different causes (compared to other age groups). Trauma, foreign bodies, irritation, urinary tract problems are much more likely. Adolescents (around the time of menarche): abnormal bleeding patterns are common around the time of the first period. If the bleeding is especially heavy or if these abnormal patterns persist then more investigation is warranted. Premenopausal women: there can be many different causes of AUB in this patient population. With that in mind, the most common causes of such bleeding are uterine fibroids, uterine adenomyosis, or endometrial polyps. Postmenopausal women (postmenopausal bleeding): all bleeding in postmenopausal women is abnormal, and all patients should receive an endometrial biopsy to rule out endometrial cancer. What is the age of the patient? In thinking about evidence based medicine, age groups can be used to decide how aggressively patients should be worked up for AUB. Is the bleeding cyclic or not? You may need to order a 21 day progesterone to try and figure this out. Cyclic bleeding is a different category. 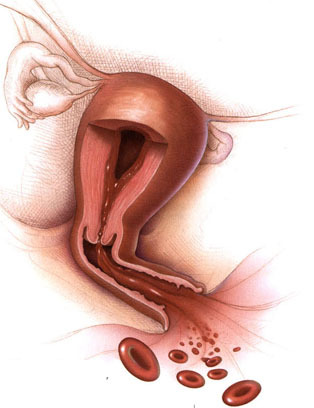 Now that the possible causes of abnormal uterine bleeding have been established, the focus can shift to how one would actually “work-up” a patient who presents with this complaint.